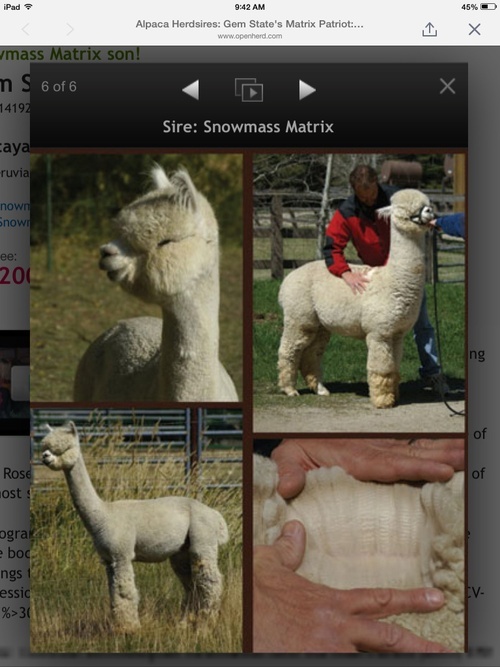 Snowmass Matrix was purchased in 2010 by Double O Good Alpacas. 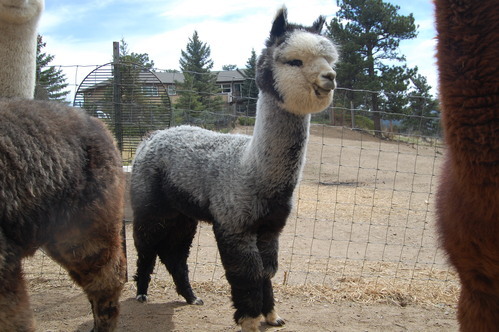 He is the highest selling male in alpaca history. He sold for over $600,000. 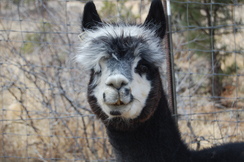 HIs 5th year fleece stats are 16.6 3.5 21.0 0.4 56.6 16.2. We just purchased this boy from Snowmass. We are planning to integrate Triumph's genetics with Granite's. Snowmass Olympic Triumph has a tremendously buttery soft dense, silky long staple grey FANCY extraordinary colored fleece giving it a very unique handle. You should expect nothing but fine from this very fine fleece line both top and bottom and you can expect this to be HIGHLY heritable. 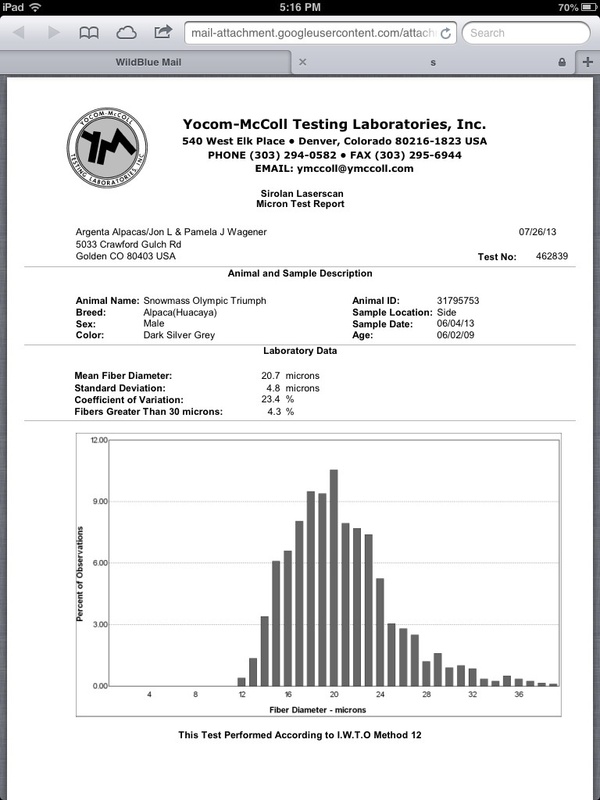 His Dam, Snowmass Olympia, remains below 19 microns in her 12th year. Her Dam is the very same who at 11 years had an AFD of 15.9. Now add Matrix proven fine lineage and the match for GREY ELITE is set in this male for HUGE success! 8-20-2013. Check out his 4 year old histogram! 10-8-2013. His first cria is here. She has lots of curly fleece! 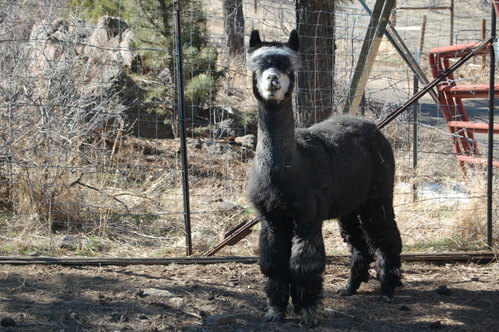 6-7-2014 a gorgeous male cria for Triumph! 7-20-2014 a black male for Triumph! 2-2015. Triumph's first cria, Platinum, has hit the show ring. In his first show he took a 2nd Place! 7-6-2016 We Love this male. Easy going and gets the job done quickly. He is an all around great boy. His fleece is still fine at 7 years old. 10-27-16. 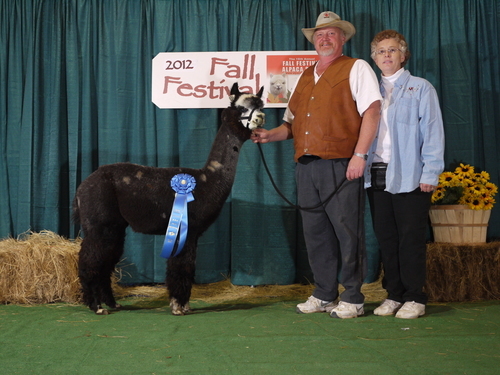 Triumph had three beautiful cria for us this year. 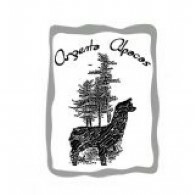 We are especially happy with his cria from our Granite daughter, Lyric. 1-2017 His daughter, Destini, tool 1st Place at the NWSS! 2-25-2017 His son, Platinum, has gone to the east coast! 1-15-2018 Price reduced. Check out Triumph’s histogram! 2-4-2018 Currently his son Duncan is doing extremely well in the shows in halter, fleece and walking fleece.